Sensible styling that complements any home. Hand inspected for performance, classically styled faucets handle the toughest of tasks with ease. 8 long spout swings 360 for added convenience. Single lever handle for ease of control. Built-in vegetable sprayer provides increased functionality. Featuring exclusive DIAMOND valve. Leland Kitchen Single Handle Pull Down Faucet, Stainless Steel The pull-down spray wand comes free with a gentle tug and gives you total flexibility. The hose extends and retracts without friction points, fed by gravity. As you raise the wand to dock it, the magnet embedded in the spout pulls the wand precisely into place. So, unlike other pull-downs that tend to droop over time, MagnaTite<sup></sup> keeps your pull-down faucet looking picture-perfect. A toggle on a Multi-Flow wand increases the stream from the standard 1.5GPM to a higher flow to more quickly fill the sink as well as pots, vases, or other large containers. Toggle back to 1.5 GPM for normal, everyday use. The innovative Multi-Flow feature can be found on a variety of Delta kitchen faucets. Delta's exclusive DIAMOND Seal<sup></sup> Technology uses a valve with a tough diamond coating. InnoFlex<sup></sup> PEX waterways keep water inside the faucet out of contact with potential metal contaminants. This powerful combination brings you a faucet built to last up to five million uses. 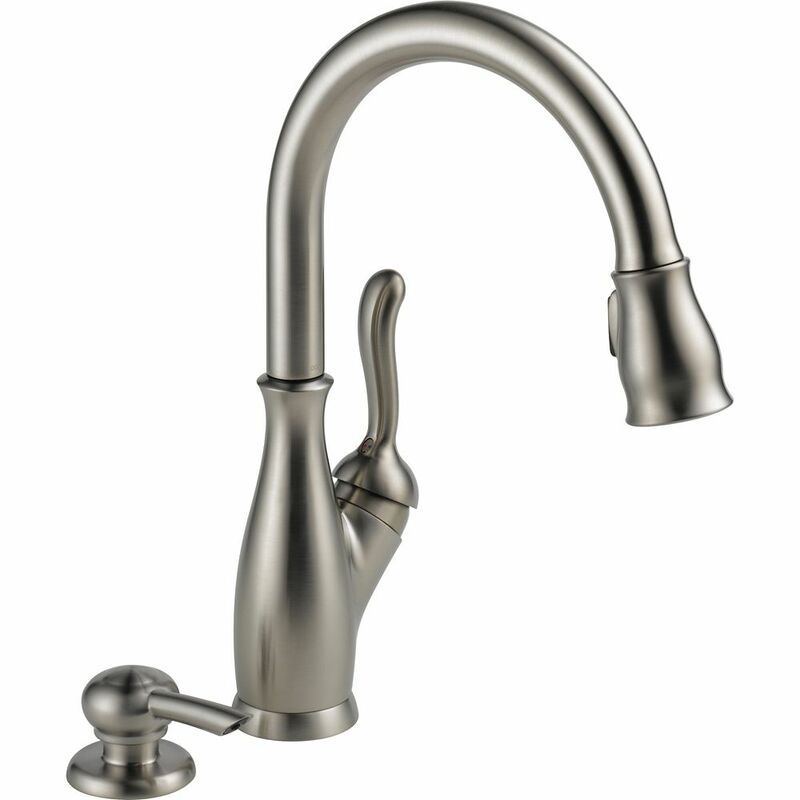 Leland Kitchen Single Handle Pull Down Faucet, Stainless Steel is rated 4.6 out of 5 by 201. Rated 5 out of 5 by Popsey from Used this in my kitchen remodel and I love it!!!... Used this in my kitchen remodel and I love it!!! Rated 2 out of 5 by jfay from poor valve We have had this faucet for about 5 years. The past three it has been difficult to turn off (have to find the sweet spot) and nearly impossible to get anywhere between hot and cold. I replaced the inner valve once, but that did not last long. And the valves are expensive! Rated 5 out of 5 by Swannie from Works great looks great!!!!! Works great looks great!!!!! Rated 5 out of 5 by HomeDepotCustomer from Solid construction and relatively easy to install.... Solid construction and relatively easy to install.